Hear examples of music composed by lesser known members of famous musical famiies. 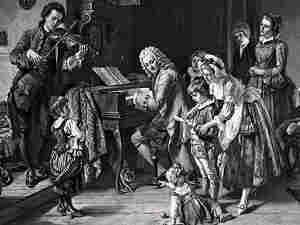 Johann Strauss Jr.: "Perpetuum Mobile"
Making music in the Bach household (from a painting by Toby Rosenthal). J.S. 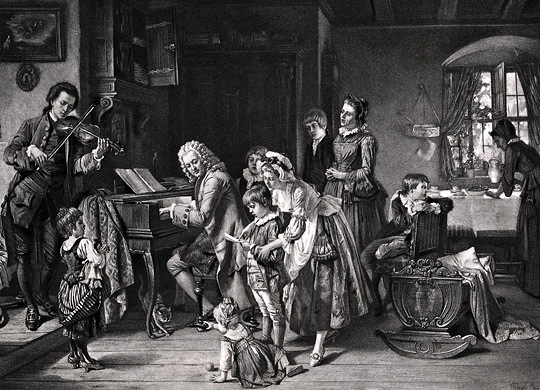 Bach's family tree included more than 50 musicians. Every Thanksgiving, classical commentator and violist Miles Hoffman offers some tongue-in-cheek musical observations appropriate to the holiday. In the past, he has talked up musical turkeys, pontificated on plucking and lectured about leftovers, to name just a few. This year, Hoffman relishes relatives — not only those members of the family who gather, sometimes only once a year, for the giant feast, but also lesser-known relatives from famous musical families. Hoffman says you would need a very large Thanksgiving table to accommodate the Bach family. The family tree includes more than 50 musicians ranging from town fiddlers to court musicians to the great man himself: Johann Sebastian. When J.S. wasn't busy churning out reams of glorious music, Hoffman says, he was busy adding to the family branches. "Bach himself had 20 children with two wives," Hoffman explains. "The sons of Bach who were well-known musicians included Wilhelm Friedemann, Carl Philipp Emanuel, Gottfried Heinrich, Johann Christoph Bach and Johann Christian. And that's only some of them. We also have cousins and uncles, and it just goes on and on." Then there were the Mozarts. Wolfgang Amadeus' father, Leopold, was, as Hoffman puts it, a "mediocre, but very well-known composer." And Mozart had a sister, Maria Anna (Mozart called her Nannerl), who was also a musician. "When Mozart and Nannerl were kids," Hoffman adds, "their father trotted them around to all the royal courts in Europe, because they were this fabulous virtuoso sibling team." Other famous musical siblings include the Mendelssohns--Felix and his sister Fanny, who was, Hoffman says, a talented pianist and composer by all accounts. She wrote more than 400 pieces of music, most of which were performed at Sunday musicales at the family home, where she was encouraged to be a wife and mother over her musical endeavors. "Now in all fairness," Hoffman says, "Fanny was by no means the composer that her brother Felix was, but she was an extremely talented musician who was not allowed, fundamentally, to have a professional career." Another talented woman who indeed did chart her own professional career was Robert Schumann's wife, Clara. "Clara was one of the great virtuoso pianists of the 19th century, also a very good composer," Hoffman says. "Clara was Robert's inspiration; she was also Johannes Brahms' greatest musical friend and collaborator and inspiration. So this woman was an extremely important figure in the history of music in the 19th century."